So one part of the event requires us to do drilling at phantom school but I keep getting exceptional error everytime I attempt to enter it. Is there any way to fix it?? My ideas weren't aimed to make Lion OP, but rather focus on his biggest weakness. They were meant to improve their weak 1vs1. Still, considering that most likely all Scientists complitly forgot or never bothered to use "Keen Sense" "Gun Overdrive" and "Speedloader" I am not surpriced my suggestions aren't popular. It is far easier to debate about skills that are used all the time like Double Shot, Berserk and Shot Spree, but now that I think about it, no one will support buffing skills that aren't used in the first place. I'd like to know if you can change it to enter SECURE CODE when players purchase something with a link like http://playtrickster...op&s=MzYyMLcwMj. Players should be concerned about the security of their accounts by changing their passwords periodically. But if A know someone B's ID, B is at high risk of hacking points or gelders through these links. But if make enter SECURE CODE, players can be a little safer. 2. I suggest repair powder to be tradable in INGAME. Most people do not REFINE themselves and request REFINE for those whohave received 90% refine star buff. IF A is refine and equip is broken, it canbe retrurned to original owner B and fix equip. But if repair power become tradable, it will be convenient. Keen Sense timed crits -> Keen Sense make normal shots always crit. Mastered Speed Reloader reduce reloading speed by 50% -> Fire 2 or 3 shots at the same time. Master Speed Reloader reduce reloading speed by 50% -> reduce cooldown of Double Shot and Power Shot by 50%. Why people play private server of TO? suggestion 'seems' good thing, but it's gonna make rTO rotten finally. When you accept a suggestion, IT MUST BE CONSIDERED CAREFUL because small change can affects overall balance, society, and system of the game. but I think there are some suggestions and thoughtless acceptances recently. Please be circumspect about accepting suggestions and don't ruin original Trickster's merit anymore. I mispelled name of skills a few times (mostly Speedloader as Speed Reloader) and I wasn't 100% clear when I made those suggestions, I get it, no need to hammer it in. I was already informed in game that I need to make my suggestions more clear in the future. I was also informed that coding on this level is very difficult in game after he fact. Also, my suggestions were focusing on improving something that is so bad that no one is using it. It is clear that when Lion was creatured for this game, it had two playstyles in mind. First one is skill spam like Berserk, Shot Spree, Double Shot and Sharp Sense (those seem to focus on AoE mostly with shield break being mostly against bosses. It doesn't help that some bosses resist shield break though and it takes too long to cast for PvP). The other is for normal shots: Keen Sense, Speedloader, Gun Overdrive (But I bet most of Scientists forgot about existence of those skills because of how useless they are). When I made my suggestions, I had in mind to make avaible something that was too useless to use. (Instead of reducing cooldown on berserk that is a good skill against many opponents, I hoped that useless skills would help Lion in 1vs1 instead). However, since changing stuff other than cooldown and duration time is extremely hard, I won't mind if my suggestions will be denied. Also, it doesn't help that my suggestions focused on buffing skills that are forgotten/useless, so most Scientists most likely don't know if changing tham will change anything, and those who don't use Lions will see it as trying to make Lions OP. In other words, there's no need for many harsh comments saying that Lions don't need OP buffs or how my suggestions are stupid, I already made peace with them not being accepted. Cooldown has been changed from 12/10/9 seconds -- > 5 seconds for all levels, including master level." I think this change is not working, my mastered berserk still takes 9 secounds to cooldown. Increasing power of "Bull's Eye" would power up not only 1vs1 but also AoE. Lion's AoE is quite good and combination of Shot Spree and Berserk is quite strong. It is 1vs1 that's a bit of a problem. (Double Shot isn't all that good and when there are a lot of mobs around, combining it with berserk rarely works). Also, from what I learned "Special Bull's Eye" is just "Bull's Eye" that was added for Lion after 6 months of efforts. I am not sure if increasing how much Bull's Eye increase accuracy would be easier or harder than let's say make Keen Sense turn all normal shots into critical shots. The way I see it, Keen Sense is useless because it works only if you time your critical hit. (You must press fire button the moment damage number above opponent's head disapear). It other words, it takes 2 sek and perfect timing to do 254% damage with normal shot. (In comparation, double shot do 240% damage twice, and a 345,6% twice if critical). 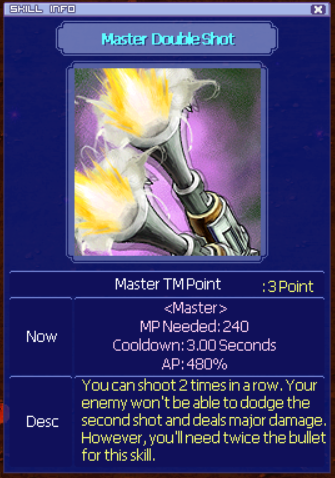 According to my calculation, if Keen Sense also made all normal shots critical, and combined with speedloader (for faster shoting) and Gun Overdrive (it buff gun's Ap for normal shots, making normal shots around 20-30% stronger), Scientist would be able to do more damage against a single target than if he just spammed Double Shot and Berserk over and over. Alternative was to make Speedloader shot 3 bullets instead of one when mastered. Since with Keen Sense you would need to time your shots perfectly every 2 seconds, if instead of 254% damage they would do 254% x 3, this combination would be worth using. (It is as if using Keen Sense, Gun Overdrive and Speedloader would give Scientist something like Tripple Shot, a better version of Double Shot). My forth suggestion was to make Gun Overdrive affect Accuracy as well, so instead of normal shots doing 120%-130% damage, they would do 364% damage. This one change would make using Keen Sense or Speedloader useful against a single target. As you can see, all my suggestions were based on calculations and were aimed only to make uisng Keen Sense + Speedloader + Gun Overdrive worth it. It was meant to make those 3 skills give Scientist 1vs1 tool that would be stronger than spamming Double Shot and Berserk over and over. It would reward Lion players for investing a lot of skill points into skills that were useless and forgotten without increasing power of their AoE. I only hoped for one of my suggestions to be used if possible (not all of them). Still, I understand that such changes may be very hard to do, and I also understand that no one remember that skills like "Keen Sense" and "Speedloader" and "Gun Overdrive" even exist since no one uses them. (Most players most likely have no idea what those skills even do). Because of that I am not surpriced that no one supports my ideas and some players even call my ideas stupid or that they would make Lion OP. The issue is that I don't know how to explain my suggestions for everyone to understand and the reasoning behind it since those 3 skills are forgotten. If I suggested someting about Special Bull's Eye or Berserk, everyone imidedly would know what I am talking about because those skills are popular and used at all time, but everyone automaticly assume that my suggestions regarding "Keen Sense" or "Gun Overdrive" or "Speedloader" will make Lion OP because no one remember what those skills even do. [a] Please change cooldown from 3 seconds -- > 1,5 seconds for all levels, including master level. I don’t intend to suggest overpowering Lions but to find a way to make them more viable for 1vs1 as suggested by CommanderX before. Edit: Thank you for implementing the cooldown reduction of the Lion skill Berserk ! I'm not sure if this has been suggested or if it is even possible (I'm not a programmer, mind you), however, I think that something that could potentially improve the experience for all players across the game would be a new chat tab called "Friend" or "Friend list" that would work just like the guild chat tab works but for the friends. One of the things that undermine this game, IMO, is the communication system, more specific regarding friends. Friend list is only used to know whether or not your counterpart is online, then you'd need to proceed and whisper/pop up message them. If we had a proper tab I'm pretty sure communication would improve across the board and more people would be able to do their quests/grind/drill and chat at the same time, improving the overall gaming experience. Why does hazel nut paste contains hazel nuts but tooth paste doesn't contain tooth? I approve of this suggestion. As much as I wish for change of never-used/rarely-used skills to give Lion more than just one playstyle (skill spaming), I understand that it would take too much effort and be very risky in terms of bugs. Personally I think that Lions need Double Shot cooldown reduction more than Berserk cooldown reduction since 1vs1 is what they are weakest at, but if I suggestion to do the Double Shot change while turning Berserk cooldown up to 7 secounds, some Scientists would get upset about it. i think this one was discussed before, from what i remember its hard-coded and changing it makes the game crash. Special bullseye sounds great. Lion's aught to have bullseye anyway. Every other job has a selfbuff that boosts a damage stat by percentage. Powers get like...eleven and Lion gets.......booster(wopwop) and lucky 7. Although special bullseye+bunker might be scary. Oh and make it so Cybers and HunterLords can use the special bullseye too. That way the girls become better shots too. Foxes and Lions already have the ability to have the special Bullseye skill. It is a 1st job skill already implemented ingame and both sets of gender can learn it. Meaning both Gun wielding types: Pure and hybrid can already utilize this skill. The Special Bullseye Skill can be purchased at Cochima in the skill card areas in paradise, garden, and in Azteca. Poll 1144 Light Wind/Earth Sheep?